Edward Henry Harriman (1848-1909), Self-confident and ruthless, he spared neither friend nor foe if they blocked his plans. He was President of the Union Pacific. He was worth $400 million at the turn of the century. His genius as an administrator made him one of the great railway builders of all time. 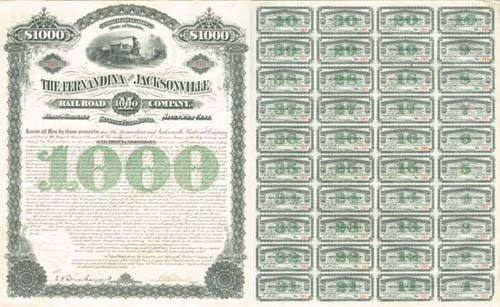 This 1880 Fernandina & Jacksonville Railroad bond is fully issued, uncancelled, has all 60 coupons, is signed and sealed three times by officers of 2 railroads and a steamboat company. Harriman signs at back with other trustees. Beautifully engraved by American Bank Note and in Superb Condition.